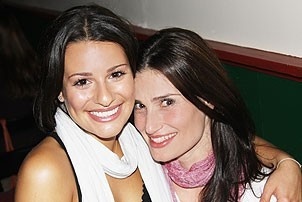 Sisters in song: Lea Michele and Idina Menzel, who play Nero's two loves, are the picture of Broadway sisterhood. Talk about your eagerly awaited projects: On July 13, Steven Sater and Duncan Sheik, the Tony Award-winning creators of Spring Awakening, staged their new musical Nero on the Vassar College campus in Poughkeepsie, New York. Part of the 24th annual Powerhouse Theater, an ongoing collaboration between New York Stage and Film and Vassar College, the work-in-progress was but one of the eight-week event's many a-list offerings, including the world premiere of Eric Bogosian's 1+1, Stephen Belber's latest play Fault Lines and readings of new works from John Patrick Shanley and Eve Ensler, among others. It's doubtful that Spring Awakening fiends needed an arm-twisting to make the journey upstate. If anyone did, well, all you had to do was say this staging of Nero featured Idina Menzel and Lea Michele on the same stage, then watch as they made like the Roadrunner and disappeared in a cloud of dust. Beep, beep!